Mild as baby soap, Rainmaker Entertainment’s game adaptation/feature-length non-playable demo Ratchet & Clank is basically the same movie as the animation studio’s earlier Escape From Planet Earth: big-chinned parody of a galactic hero, planet-threatening super-weapon, cast of celebrity-voiced aliens who look like they’re molded from soft PVC, and so on. It’s kid safe and cheap looking, animated strictly on-model with no pizzazz, and based on the same formula of rote life lessons and lackluster character and background designs as the more expensive (but equally forgettable) Home, Monsters Vs. Aliens, and Mars Needs Moms. Like a lot of entertainment pitched at the family matinee audience, it sits at the zero point of watchability. 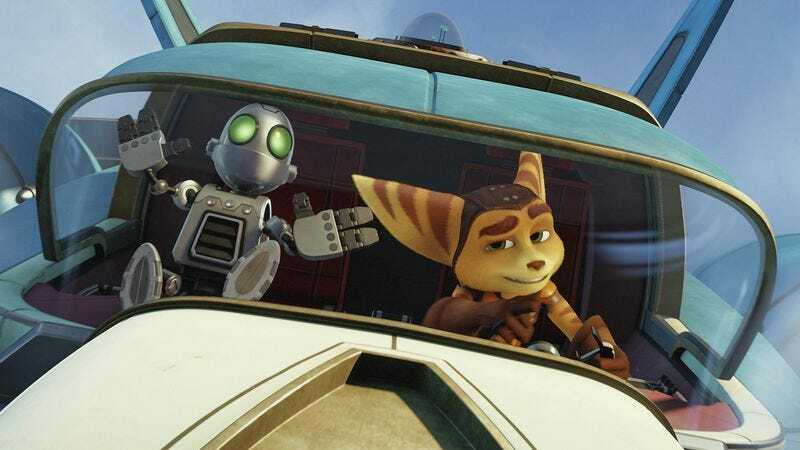 Timed to the release of a PlayStation 4 remake of the original game, for which it more or less serves as a preview, Ratchet & Clank is easily the most faithful video game adaptation ever made, and also one of the least interesting. It seems to have ported assets directly from its action-platformer source material. 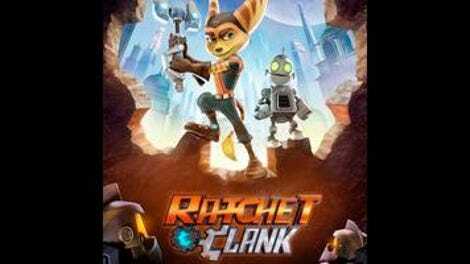 Ratchet (James Arnold Taylor, one of several voice actors carried over from the game series), Fennec fox-looking resident of a desert planet, finds a crashed robot, whom he names Clank (David Kaye) and occasionally wears as a jetpack. Together, they set off across the galaxy to convince space ranger Captain Qwark (Jim Ward) to stop a butternut squash in a suit named Chairman Drek (Paul Giamatti) from firing the Deplanetizer invented by goblinoid peapod Dr. Nefarious (Armin Shimerman). Even objectively bad movies based on games (e.g., Hitman: Agent 47) try to synthesize some of their appeal. But with the exception of a sequence in which Ratchet gets to try out an arsenal of colorful weapons and gadgets at test range, Ratchet & Clank is all plot, all the time. Director Kevin Munroe (Dylan Dog: Dead Of Night, TMNT) doesn’t give it much flash; here, the simulated camera sometimes suggests the inelegant staging of an in-engine cutscene. With the nominally limitless possibilities of digitally animated space, Ratchet & Clank comes up with a view of a galactic metropolis limited to a single plaza and lots of corridors. Even its twitches of ambition are somehow outdated—say, a ride in an out-of-control spacecraft that’s clearly modeled on the pod-racing sequence in The Phantom Menace. The jokes aren’t much better, a combination of weary running gags (mostly involving a robot who keeps changing sides and some bit characters who resemble de-shelled turtles) and jabs to the rib. Here, the bad guys know they’re bad and the good guys know they’re cool, which isn’t very funny or irreverent, but is still treated as a self-evident laugh. It’s too lightweight to be obnoxious, and the better-than-average voice cast helps. But the best things that could be said about Ratchet & Clank all point to how middling it is. Games can make formula fun simply by making it playable, but movies are stuck with a trickier standard.